Navy Wife Life: So Does The Wine Bite Back? So Does The Wine Bite Back? May not be the best picture in the world, but it's a pretty good wine. Found it in Total Wine for about $10. Found it interesting just because of the name. Yes I'm weird. I read vampire stories and was such a Buffy fan. So Mom bought it for me. Jim told me he'd kill me if I brought another bottle of wine home. Couldn't do that to Mom though could he? Especially since she's drinking up our sweet wine. Could have gotten a Cabernet Sauvignon or a Pinot Noir. Please note they are both reds. 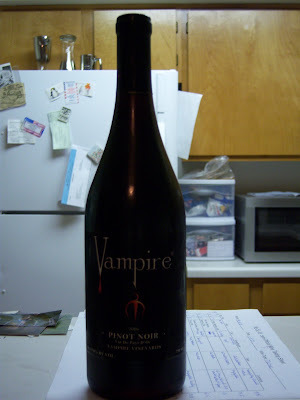 Since it looked to be from California I chose the Pinot Noir since I can find a good Cab Sauv at my winery. It's quite good actually. And if I weren't so darn tired I'd research it a bit to find out more about them. Oh well. I can do it later.